The Treasury Casino and Hotel is named after the building in which it is housed, this casino utilizes the old Treasury building making it a very imposing building to house the only casino of its kind in Brisbane. The second part of the complex takes up the old Lands Administration Building which is just as impressive. Treasury City Casino Games – You will find in excess of 80 card and table games available inside the Treasury Casino including many of the more popular types of game including both low and high stake Roulette and Blackjack tables and some of the more exotic card games. Treasury City Casino Slots – You could spend days playing all of the slot machines on the Treasury Casino floor their are over 1300 gaming machines all offering a wide variety of theses, bonus features and multi stake options. Many inhouse progressive slots are also available, so a large jackpot win could be just one spin away. You will also find a large collection of Aristocrat designed and developed slot games, this huge gaming machine manufacturer has its roots in Australia, and players often refer to the slots are Pokies! 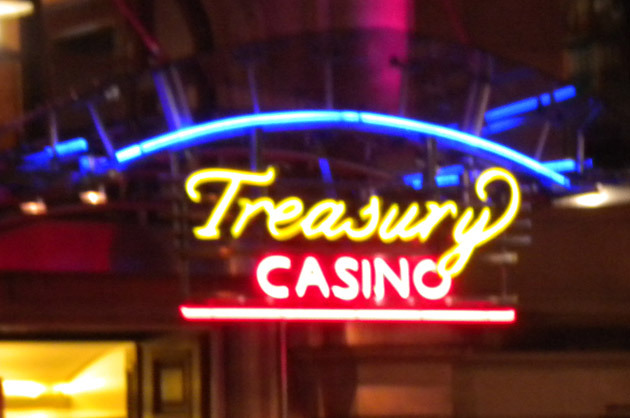 Treasury City Casino Address – You will find the Treasury Casino right at the at the top of the Queen Street Mall, Treasury City the postal code is QLD 4000. Should you wish to contact them by telephone then their number is (61) 7 3306 8888. Treasury City Casino House Rules – You will be required to be dressed appropriately in smart, casual clothing. No person under the age of 18 will be permitted entry to the Casino at any time. Treasury City Casino Opening Times – The Casino is open each and every day, and is open 24 hours a day, The only exceptions to these opening times are on Christmas Day, Good Friday and Anzac Day, when opening times may vary. 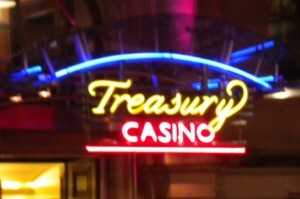 The Treasury Casino also has a large Hotel complex which offers 130 rooms of varying types and sizes. You will find lots of value can be hard by booking direct with the Hotel which often has special weekend and midweek deals available, checkout their website for full details. There are no less than six Restaurants open throughout the day and night within the Treasury Casino complex, so no matter whether you are looking to grab a quick snack and get back to the casino floor, or are looking for a fine dining experience you will find a venue that caters for your needs! The Treasury Casino can, at times, be very busy, so if you are looking to gamble in a more relaxed and none chaotic type of surrounding, then try avoiding the major holiday and peak times of the year, this can also be a good time to bag some of the very best package deals and promotions should you wish to combine your casino play with booking one of their hotel rooms or suites.